Maria Soledad Cisternas Reyes, Special Envoy of the United Nations-Secretary General on Disability and Accessibility, speaking at the workshop on social integration. A workshop on social integration and the launch of the campaign for the good treatment of girls, boys and adolescents with disabilities took place at Strathmore University Microsoft Auditorium during the International Day of Persons with Disabilities. 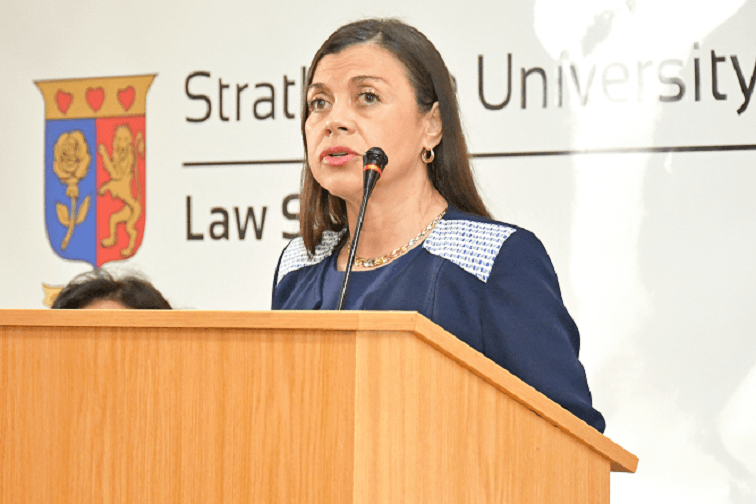 This workshop was the result of a collaboration between the Strathmore University Law School, the Embassy of Chile in Kenya, the Special Envoy of the UN-SG on Disability and Accessibility, the Special Olympics and the Orione Community Training Centre. Maria Soledad Cisternas Reyes, Special Envoy of the United Nations-Secretary General on Disability and Accessibility, is on a worldwide tour to launch the campaign which includes a Decalogue called ‘10 principles for my protection, well-being and development as a girl, boy or adolescent with disabilities’. The Decalogue was prepared on the basis of interviews with children with disabilities and a focus on adults with disabilities in relation to their experiences of childhood and adolescence. In her remarks, Maria Soledad said, “Bad treatment and abuse of children with disabilities are violations of human rights that we must denounce.” She was awarded the National Human Rights Prize of Chile in 2014. According to the World Health Organization (WHO) 2009 figures, persons with disabilities in developing countries such as Kenya account for 15% of the total population. Disability in Kenya is often seen as burdensome and shameful with children and youth left to suffer discrimination and stigmatization from both family members and society. They are often kept away from the public eye, hidden, and not to be seen by society. In this forced seclusion, their rights and freedoms are constantly abused. Since 1992, the United Nations International Day of Persons with Disabilities (IDPD) has been annually observed on December 3 around the world. The theme for this year’s IDPD was “Empowering persons with disabilities and ensuring inclusiveness and equality”.